Belt Conveyor withstands more than 1,000°F. Stainless steel, wire mesh belt conveyor offers thermal resistance combined with 60% open flow area. All supporting surfaces are round and formed in single-piece lateral spiral. Belt affords both lateral and longitudinal flow of air or liquids. Odor and flavor absorption are eliminated because belt is virtually immune to chemical reaction. Available in widths from 2–12 in., conveyor is suited for cleanroom and food, pharmaceutical, and medical equipment applications. 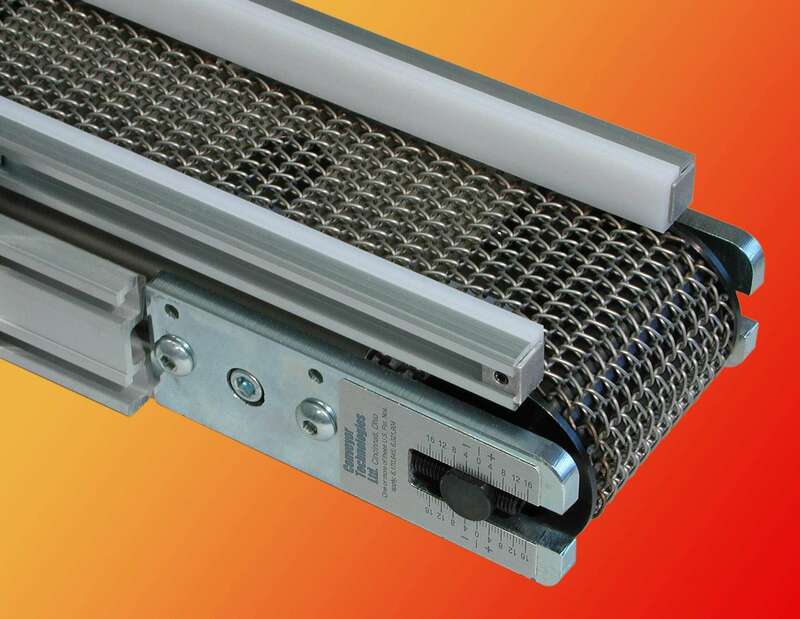 April 2004 —Conveyor Technologies' newest development in modular low-profile conveyors features a stainless steel wire mesh belt with exceptional thermal and chemical resistance, combined with a 60% "open flow area." Capable of handling part contact temperatures above 1000°F, the belt construction affords both lateral and longitudinal flow of air or liquids throughout the entire belt, making it ideal for heating, cooling, wash down or flush-and-drain applications. The conveyor's open belt construction enables easy and thorough cleaning and inspection. Odor and flavor absorption are eliminated because the wire mesh belt is virtually immune to chemical reaction. The conveyor is highly suitable for cleanroom and food, pharmaceutical and medical equipment applications because there are no belt fibers or plastic abrasion particles to cause contamination. "The contoured supporting surface of the wire mesh belt affords only minimal contact with the product, making it perfect for handling many food and drug products, or for draining parts that are saturated with coolant or other fluids, which can drain laterally through the belt without contaminating the return side, " said Charles Mitchell, president of Conveyor Technologies. The wire mesh belt conveyor is available in widths from 2" to 12". All product supporting surfaces are round and formed in a single-piece lateral spiral, which imparts high lateral stiffness to the belt and allows openings in the frame surface for air or fluid flow. The belt allows easy replacement of modular sections if damaged. Internal automatic spray wash can be applied providing 100% belt coverage on the return side. This unobstructed reverse flush through the belt provides the most efficient belt cleansing. Available guide rails include UHMW or high temperature UHMW that can withstand part temperatures up to 500°F; stainless steel to handle wash down or part temperatures to 1000°F; optional anodized aluminum Dual “T” Slot Rails are available for attaching accessories. positive-traction, centering-drive pulley eliminates slippage and tracking problems. Belt life is extended by a flanged, bearing-mounted idler, which reduces sprocket engagement wear by 50%. As in all Conveyor Technologies low-profile conveyors, bearings and drives are sealed for life and require no further lubrication. The stainless steel wire mesh belt conveyor joins the Conveyor Technologies line of low-profile conveyors, engineered for flexible, high up-time production, which have proven ideal for automation of work cells, packaging machines, automation, assembly and similar operations. A broad selection of modular low-profile conveyor designs enables close application-tailoring at standard unit economies. Line choices include end-drive, center-drive, cleated, magnetic, vacuum, high temperature, high speed, self tracking, and AccuMove precision indexing conveyors.